Back in 1970, a Viet Cong sniper began shooting at a U.S. Army camp. Unsure of his location, the troops unleashed a barrage of fire that turned the hillside into a veritable hellstorm. 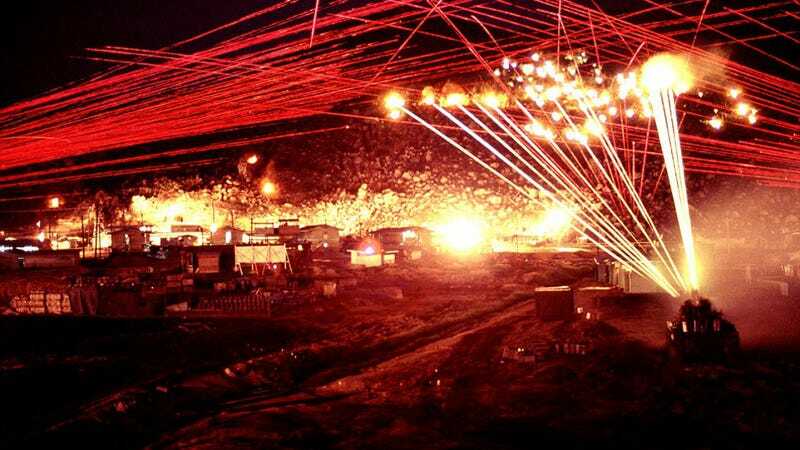 Now, four decades later, Vietnam War veteran and photographer James Hensinger has released the incredible images he took that night. All images: James Speed Hensinger/Rex Feat. Hensinger was just 22-years old at the time and a member of the 173rd Airborne Brigade. In April 1970, a sniper began spraying automatic rifle fire on his army based in Phu Tai, near the coastal city of Da Nang. The assault on the sniper's position begins with rounds fired from the 40mm auto-cannons on an M42 anti-aircraft tank. Flares were then launched into the hills, while a pair of M-60 machine guns in guard towers began to fire. Their tracer bullets can be seen in red. Hensinger is quoted in the Daily Mail: 'The guy would stand up from behind a rock and blow off a clip from his AK47 on full-auto. The sniper was shooting at such a high angle that most of his rounds came through the sheet metal roofs of our hooches. We decided to use a 'heavy' response the next time the sniper hit us." Hensinger set his Nikon camera to take long exposures during the assault. The M42 tank's .50 calliber machines guns let loose. Thousands of rounds were rained down on to the hillside. "We sent out patrols during the day, and found a blood trail one morning. Otherwise, we never found him."